The last time we visited The Pentacles in Card Four, they seemed financially stable and well on their way to reaching their goal. They were steadily building their finances and were possibly on the brink of starting their own business or investing their savings. However, we also noted that their was an air of tension and stress surrounding the effort to maintain financial stability. We wondered whether the Figure in the card was working hard to hold on to his money and possessions or was it fear of scarcity that drove him to stockpile and hoard his cash. Then again, we had to look at the possibility that pure greed and miserliness were to blame. The reality is that it could be any one of them or all. As we enter the scene in The Five of Pentacles we at least can be sure of one thing and that is his circumstances have radically changed. After the Four, we would have expected to see obvious signs of comfort and growing wealth. We would have expected a thriving business, land, property, designer clothes and expensive horses. What we didn’t expect to see are the two desperate looking creatures scurrying and hobbling along in the dark snowy night. They look the farthest thing away from financial comfort that you can get. All the woman in front has between her and the frigid night air is an old ragged cloak which she pulls tightly around herself in an attempt to retain whatever heat that is left in her. Hunched over and head bowed in the face of the icy wind, she slowly moves forward. Her feet are bare and probably frostbitten. Behind her hobbles a smaller person, possibly young, who appears to be crippled or injured as he needs two crutches to support him. We would wonder what he is doing out on such a terrible night. Walking in the snow is treacherous enough with two firm feet on the ground, but trying to make any sort of progress with an obvious disability and worn down crutches is asking for trouble. He is not well enough to be out and about but there is the possibility that he has no option, for he may not have anywhere to go. 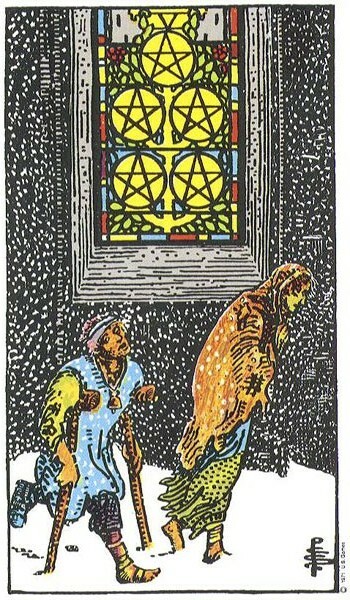 The two Figures in the Five of Pentacles look homeless and destitute. They wander the streets at night, lost in their misery and suffering. “God help them” we think as we acknowledge their plight. Surely there is somewhere they can go, somebody to help them, someone to feed and care for them, or a place where they can find comfort, for at least the night. Tired, hungry, ill and half freezing to death, they may not survive the night if they don’t find help soon. We hope they know of a place that will take them in and that they are heading there right now. As they wander down their lonely, cold road we cannot help but notice the stained glass window in the background. Could this be a church or a place of worship? If it is, then surely they could seek sanctuary there and would be made feel welcome. Yet, the Figures seem to be totally unaware of its presence. The Five Pentacles depicted in the stained glass look like a strong healthy tree and suggest that there is financial stability within, and the resources to feed and nourish plentiful. If you look closely at the top of the window you will see two towers or castles just above the stained glass. The Castles represent stability, sanctuary and protection but they would need to climb up on the window to even notice them for they seem far away and out of reach to the wretched Figures walking by. The church and stained glass window suggests that there is a spiritual aspect to their want yet the focus of their suffering and loss is on the two distant castles, the material world. They may have owned these two castles and lived in them, but now they are gone and probably a lot more too besides. Left with nothing but the shirt or cloak on their backs they are shocked and ashamed by their situation for this is not what they had planned or had prepared for. If things had gone well for them then they would be sitting up in those castles right now, entertaining guests or making business deals. They now believe they have lost everything and have little left to live for as they trudge through the deep drifts. The two wretched-looking Figures forget that besides the effort that must be made to look after and provide for the physical, they also have a spiritual duty. However, they ignore this aspect and cannot understand its relevance to their situation or plight. Over the course of time they have become disconnected from their spiritual side which would have sustained them during this hard time of loss and want. They can only think of their material needs which, might easily be sorted if they stopped letting their personal pride get in the way of asking for help. The two Figures want on a spiritual level, and this, when closely analysed closely, is at the root of their misery. It is no wonder then that they walk by the church instead of into it. Financial and Material loss is suggested by the Five of Pentacles. The Pentacles along with representing the material world also represents the physical self. The Figure on crutches can symbolise poor health or illness. It also suggests that he can no longer stand on his own two feet or support himself, so financially he may be bankrupt or ruined. 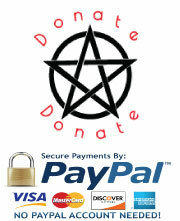 The money and possessions the Pentacles type thrive on have gone and they are left with nothing. Money, and having and getting, is basically what their world revolves around, so this is a shocking blow. Snow falls from the sky and covers the ground adding to their misery. If they were to look up they may notice the church (their spirituality) and the comfort it may offer. Instead they choose to remain in the cold. Only thinking of their own piteous circumstances, they seem to be unaware of each other, for this is a lonely road they travel. If they reached out to each other, they may realise they are not the only ones in such dire circumstances and that there are others even worse off. They would be stronger together and may even form a plan to better their chances of survival. The cripple may have, or know, something of use that the woman does not and vice versa. Unfortunately, everything has become very personal. They keep their troubles to themselves and are not interested in how others are managing to cope. There may be people or organisations behind the stained glass windows, or even friends and family still living in the castle who would be willing to help, but pride may have prevented them from disclosing the full extent of their plight. They may feel too important or too ashamed to ask for help. They may find their circumstances humiliating and degrading. They might prefer to go without rather than to be seen claiming welfare benefit or assistance. Feeling like low-lifers, they find it hard to think in any way positively. As a result, the naturally healthy and well nourished Pentacle constitution may begin to fail as they fall into negative mindsets and self-neglect. Illness can set in as they become vulnerable to virus and disease along with being run down and malnourished. They have forgotten their way or who they are, for they have let their possessions and wealth define them. The misery outside is a reflection of the misery inside. Their very negativity stands between them and abundance. The Universe will supply for them but they have lost faith and believe they are doomed. Because we are dealing with the Pentacles we must also consider that these wretched Figures are not as badly off as they think. The scene depicted in this card may only be in their mind and not a reality. If they have come from a background of want and deprivation they may have psychological issues to overcome about money and financial security. They may live in constant fear of having to go back to that type of existence and so, worry incessantly about money, what they are getting, how much they are spending and the cost of everything. There may be a tendency to go without, rather than spend a cent. During this time of global recession, the media and press feed us a daily diet of negativity and despair. They tell us we have no money, no jobs, no future for our children, of terrible waiting lists in hospitals and that most of us will lose the roof over our heads. For many, that is the terrible gloomy reality of daily existence as they become a statistic or victim of government mis-management, banking abuse and a downturn in global markets. However, there are many, many people who are doing quite well, if not better than before. They have jobs, savings, second homes, holidays and a social life. They may have taken a hit here and there but nothing drastic has come to be. Their circumstances have altered only slightly but now they have become nervous and anxious about their financial situation. They talk of having to tighten their belts, having to cut back on their grocery shopping, having to get rid of one of the cars and cancel their yearly vacation. They begin to watch every cent as if it is the last one they will see. The house goes unpainted and repair jobs fall behind. They talk to friends and family constantly about the recession and worry about what is to become of them all. They have been brainwashed into a feeling of scarcity and want. Instead of spending and being happy, they hoard and count, allowing austerity into their mind and heart. In this state of mind, they turn into self-protection mode and baton down the hatches. They feel they are not in a position to help anyone else as they barely have enough for themselves to get by. They think they have nothing because they have been told so many times they haven’t. Recession can bring out the best and worst in people. We hear of amazing acts of generosity, neighbours feeding and clothing the less well off in their area and massive donations given to charity but we also hear of terrible meanness of spirit, selfishness, lack of compassion and disinterest in helping those in need. The Five of Pentacles card is never welcome in a reading as it raises many questions for us, and speaks to us of lack and want on all levels. It also asks us how aware we are of the poverty of those around us and how charitable we are in such situations. Do we help wherever we can, or do we believe that it is the responsibility of others? In other decks of cards, the Figures in the Five of Pentacles are often depicted staring through the window at a group of revellers sitting down to sumptuous food and drink. As they stare in the window we see the stark contrast between those that have and those that don’t. The Figures who stand outside in the cold feel ostracised or alienated from the world of comfort and security within, while those inside appear oblivious or indifferent to the hungry wretches without. We are left to wonder if their conscience is even remotely effected by the meal they sit down and the obvious want on the other side of the window. Could they do something to help the two outside who are down on their luck or do they just wish they would go away? Hopefully, there are some within who feel compassion and think “there but for the grace of God go I”. Those who stand outside the window, may once have been included in such gatherings but their circumstances have changed and whereas once they were welcomed, belonged, or had tables reserved for them can no longer afford such luxury or position. Those who sit within, may once have been their friends or colleagues but lack of means and status have changed their relationships. They may have become an embarrassment to those within and with nothing material to gain from a relationship with two down and outs, have dropped them from their circle of friends. The Five of Pentacles can bring the high and mighty down earth with a hard painful bang. Levelling and humbling, the implications of this card can put your whole life to date under a microscope. The two Figures in depicted in this card may have to face up to some painful facts. As they stand out in the cold; hungry and homeless, ill or penniless, they may realise that they have no friends at all or that they forsook the real friends they had in favour of these monied ‘movers and shakers’ when they were sailing on the crest of a wave in life. During the boom time of their personal success, they may have had no time for the ordinary and familiar. Instead, they wanted to move in circles where they could rub shoulders with those who could facilitate their upward climb. Status, money and power ruled but now they have been downgraded to Loser Status and Blacklisted. They may not have seen or contacted their old friends or family in some time which, makes them even more reluctant to ask for assistance or any favours now. They may have lost their “Big Job”or Thriving Business due to recession and gone with them are all the benefits and perks that made them the envy of all. So, they continue to wander in the dark cold, social outcasts, pariahs on society, their minds closed, bitter and negative. We must also look at these two Figures in another light. They may feel ostracised, alienated or outcasts for a very valid reason. They may see the spiritual building or castles but know they will be not welcome. They may have done something which resulted in them being turned out onto the street. They may have destroyed a family reputation or an affair has been exposed. They may have got caught up in illegal business deals and now find doors and opportunities closed in their face. The Figures may also have forsaken, wealth and the material world in favour of a more simplistic life but the Five of Pentacles is traditionally linked with losing everything because of an unsuitable or unspeakable relationship. Money may also be an obstacle in pursuing the one they love for either of these Figures. They may feel out of their league. However, traditionally this card also dealt with marital vows and promising to “love, honour and cherish your spouse in good times and bad and in sickness and health”. The scene in The Five of Pentacles can also depict the burden of being a single parent, feeling like you are dragging your child along with you everywhere you go, with little help or assistance. It can also represent the despair of a mother trying to find medical help or a cure for her sick child but surrounding cards would need to support this. The Figure in front may also feel that the young Figure behind is holding them back or is an obstacle to them be accepted by certain people or in certain quarters. It can also indicate caring for one who is ill. The young crippled Figure in this card can simply symbolise the broken dream and fractured goal of ambition of the main Figure. It hobbles behind, regardless of its uselessness and lack of success, for it represents the financial baggage that can result when plans fail, businesses collapse and jobs are lost. The crippled Figure may represent unhealthy bank accounts, debts and mounting bills that are slowing down the Figure in front. Progress and recovery will be slow indeed. 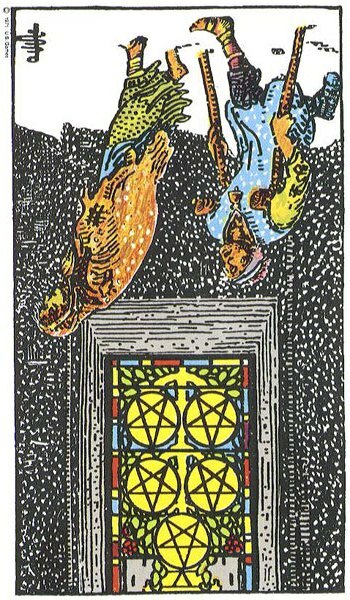 However, the Pentacles are made of stronger stuff and providing they can regain their determination and a positive attitude, it won’t be long before they start to climb out of the big dark hole they fell into. They may have to struggle like they never had to before and will have learned some hard lessons, but, there is one thing the Pentacles in their Upright state are not afraid of, and that is, hard work. *The next time we visit the Pentacles in Card Six, we will be eager to see if they have managed to sort their finances and accommodation problems or will we still find them wandering the streets in the cold, even more wretched than they already are. Something tells me that this is only a temporary set-back and will recover.They may even be stronger than they were before. I would hate to think of them not making a comeback for we are relying on them to provide for us all. Absolutely brilliant, love your way of explaining the cards. This is as good as l’ve ever read on tarot. Thrilled to get such a great review. It makes all the hard work worth it. I wouldn’t be able to keep going without the ongoing encouragement of my readers. 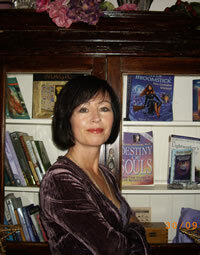 Thank you so much and I am delighted you got so much out of it. You have an incorrect word usage on this page “form a plan to better there chances of survival”. It should be “their”. Got it and sorted. Thanks for the alert. Hard to proof-read everything. Something always gets overlooked no matter how many times I make corrections.